To help realise its ambitions of being the UK’s leading independent profiling and processing company, the PP Group has consolidated its business interests by bringing its three manufacturing facilities in Salford, Gorton and St Helens, under one roof – a new 110,000sqft facility in Oldham. Moving to its new factory in 2017, the £9m investment included a 36m oxy-fuel and plasma cutting cell from Kerf Developments. To emphasise how central the Kerf RUM4500g oxy-fuel and RUM4500p high-definition plasma cutting cell has become to the company’s strategy for continued growth, over 400 tonnes of steel is now being processed each month, a figure that equates to almost 40% of the material that passes through the doors of the 100-employee company. With plasma and flame cutting being central to business activities, selecting the most suitable machine was critical. 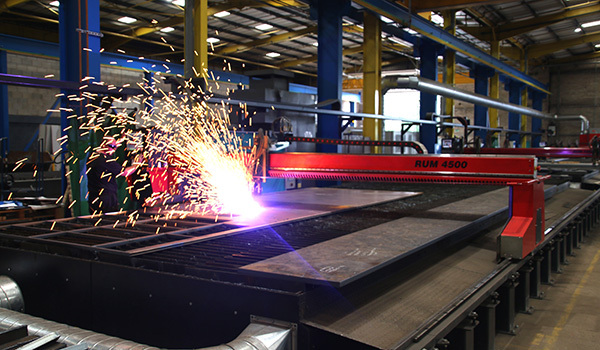 The bespoke production cell configuration chosen by the PP Group features a 12 x 3.5m bed with an RUM4500p single gantry 400 A Lincoln Electric plasma cutting head (with Ultrasharp cut technology) and a 24 x 3.5m table featuring two RUM4500g gantries, each with four oxy-fuel flame cutting heads – all on a single platform. This single bed configuration has streamlined workflow and improved throughput while the eight oxy-fuel heads have improved productivity by more than 35%.